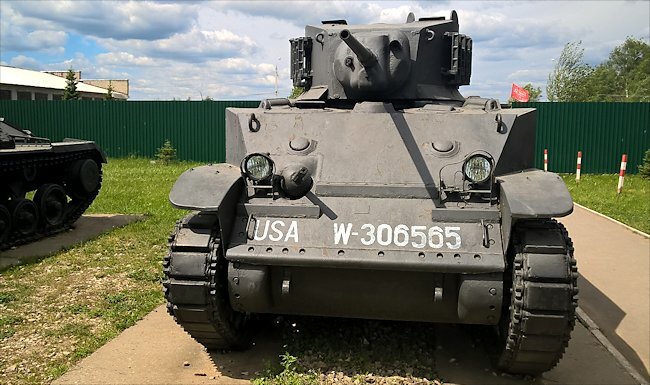 The American built M3 and M5 Stuart Light tanks were shipped to Soviet Russia during World War Two under the Lend-Lease agreement. 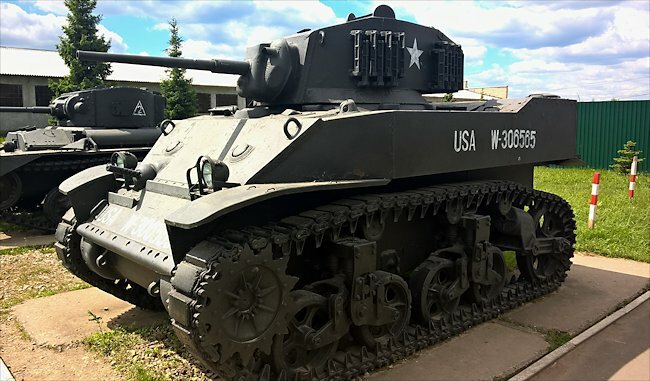 Five M5A1 Light tanks were sent for evaluation but were rejected by the Red Army High Command in favour of more Sherman tanks being sent under the lend-lease agreement. The Russian tank crews did not like them because of their height making them an easy target, thin armour and lack of a powerful main gun when compared to the Russian built T34/76 medium tank that was rolling out of the factory gates at the same time as the Stuart tanks arrived at dock side wharfs. 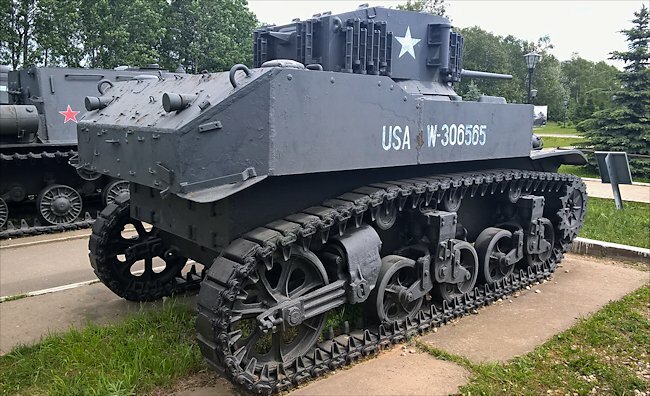 The M5A1 Stuart Light Tank was armed with a 37mm M6 Gun and two .30cal Browning machine guns. One was mounted on top of the turret and another next to the main gun in the turret. Its armour thickness ranged from 12mm to 67mm. Surprisingly this small tank had a four man crew: a commander, gunner, driver and co-driver/machine gunner. It was very cramped. It was powered by a Cadillac Twin V8 engine that produced 220 bhp. It gave the Stuart a maximum road speed of 36 mph (58 km/h). It did not have room for large fuel tanks so it only had an operational range of about 100 miles before it needed to be refueled. A total of 1,336 M3 Stuart light tanks were shipped to the Red Army during the war, nearly all of them being the diesel powered version. A small number of earlier M3s were shipped from UK stocks in 1941. This was a quarter of the overall volume of M3 light tank production. Because of U-boat and German bombers attacks on shipping 440 tanks were lost during transport. In 1942 the Red Army had received 977 M3 Stuart Light Tanks, 298 of them arrived via Iran in the south. The Stuart was criticized by the Soviets for its high silhouette, and the hull machine-guns were ridiculed as being useless but they liked its high rate of speed, easy of control and good diver visibility. In trials they found the rubber-metallic tracks could not climb up a 25 degree slop in muddy conditions. Also that when driving on an angle the tracks had a tendency to slip off. This was a concern. The thin tank tracks, whilst okay during the summer months, caused a lot of mobility problems during the wet muddy Russian Autumn and Spring months. They were also impractical when tasked with covering snow and ice covered open ground. The weight of the tank just forced the thin tracks to sink into the mud and snow like a warm knife going through butter. This was a lesson the Russian tank designers dealt with by making sure the KV-I and T34/76 tanks all having very wide tank tracks to decrease the surface pressure and spread the load over a greater area. In the gunnery trials it was found that the M3 Stuart's gun could penetrate any enemy tank that was on the battlefield in 1941. The criticism of the lack of power of the gun only came later when the German tanks had up-armoured and these light tanks still remained in use up until 1943. While both these complaints were justified, the Stuart was superior to the T-60 in nearly all respects, and comparable or superior to the T-70, Five M5Als (the M5A1 at Kaubinka tank museum was one of those five) and two M-24 Chaffee light tanks were provided as samples, but the Russians requested more M4A2 Shermans instead.